In the middle of November, the Glen Lake High School Envirothon team and coach/science teacher Karen Richard found themselves in something of a spot. The team wanted to build a solar array at the school, and they needed a total of about $30,000 to do so. The team had secured $10,000 from the school board for the solar array and about another $10,000 from various grants, but the team was still short $10,000. Adding to the pressure, some of the grant money had to be spent by the end of school in June 2019. Coach Richard had heard of Groundwork’s newly developed SolaRISEcrowdfunding platform that helps nonprofit organizations raise money for renewable energy projects. After explaining the crowdfunding idea to the school administration, she invited Groundwork to discuss it with her and the Envirothon team. At the meeting, the Lakers learned that SolaRISE was so new, it hadn’t even gone live yet. The Glen Lake High School Envirothon team would be the first organization to test drive it—always some risk in going first. Glen Lake's 2018 State Championship Envirothon team at the national competition. Last year's team launched the solar array project and this year's team is taking it over the finish line. From left: Carson Reay, Emma Karagas Spencer, Sonja Stairs, Stella Young, and teacher Karen Richard (teammate LuAnne Dreves not pictured). The team and Richard decided they were OK with being the test pilot, but a bigger issue that concerned them was the school schedule. Thanksgiving break was the very next week, and the extended Christmas break was just a few weeks beyond that. The whole school would empty out for a two-week vacation just about the time the Envirothon students would be ready to announce the crowdfunding project. Showing the same determination that had propelled them this far, the team decided they would commit to trying SolaRISE and announce the fundraiser drive at halftime during a basketball game on December 19. Two days later, the school would shut down for two weeks, and the students wouldn’t return until January 2, just eight days before the January 10 deadline the students chose for closing the crowdfunding campaign. At the basketball game halftime show, the Envirothon team took the floor—the latest of a team that had won eight state championships in the past 15 years—and made their pitch to the crowd. Out in the hallway, for good measure, stood a table with a jar for donations—a time-tested technique, for sure. And the crowdfunding campaign was on! In a true show of community support, donations came forth in following days; some donations were more than $1000, several donations were less than $100. Businesses donated. Individuals donated. A person with a family foundation donated. It all added up. As the deadline drew near, Coach Richard was not worried, but she concedes she did start hatching Plan B’s. “I started thinking about other fundraiser ideas for after the deadline, and I did apply for another grant,” she says. But with three days to spare on that tight, Christmas vacay–impacted deadline, the Envirothon students not only hit their goal, but exceeded it! As for the school board, “They supported the solar panel right from the start,” says longtime board member Patrick Middleton. He owns a software development firm, and an aspect of renewable energy that really resonates with him is it’s one of the few technology fields that has rural job growth as part of the formula. “I think that is huge,” he says, with the economic futures of Glen Lake students in mind. Unlike one-size-fits-all crowdfunding platforms like Go Fund Me, SolaRISE offers participating schools, churches and other nonprofits a range of support services. Ric Evans, project leader, ran a small renewable energy company for more than a decade, and can help clients determine the size of the system they need, assist with putting out bids and choosing contractors, and offer technical advice all the way through installation. SolaRISE also provides assistance on the publicity, marketing and fundraising. 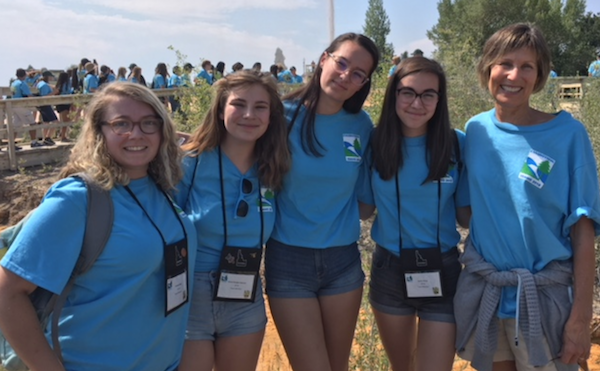 In Glen Lake Schools’ case, the Envirothon team had been so thorough (part of the reason they’d won state championship the prior year with the solar project!) that they had already spec’d out the system and received bids from three vendors. We love how smart and thorough the Glen Lake Envirothon team's Powerpoint presentation was when it laid out the justification for installing a solar array at school. Give it a read (and share with your school's decisionmakers). Students can use data from the system as they study energy in physical science, physics, and math classes. Problem solving skills can be developed and used as students continually investigate how to improve and increase the system. Students can gain information about how renewable energy can be used and developed. Students can learn about changes in the amount of insolation our area of the earth absorbs throughout the year and can learn the optimal angle to tilt the panels to absorb light. Students can be actively involved in changing/adjusting the tilt of the panels as the angle of the sun’s rays change throughout the years. Students can also learn about how the angle of the sun’s rays change through the changing seasons. Students can gain a sense of environmental stewardship while taking care of the solar panel and understanding how it benefits the planet!